I am Miss Kanagawa. 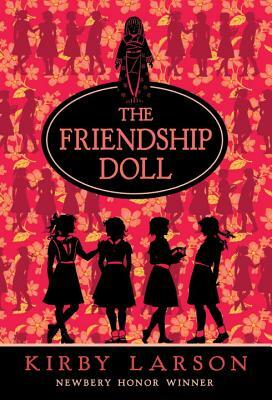 In 1927, my 57 doll-sisters and I were sent from Japan to America as Ambassadors of Friendship. Our work wasn't all peach blossoms and tea cakes. My story will take you from New York to Oregon, during the Great Depression. Though few in this tale are as fascinating as I, their stories won't be an unpleasant diversion. You will make the acquaintance of Bunny, bent on revenge; Lois, with her head in the clouds; Willie Mae, who not only awakened my heart, but broke it; and Lucy, a friend so dear, not even war could part us. I have put this tale to paper because from those 58 Friendship Dolls only 45 remain. I know that someone who chooses this book is capable of solving the mystery of the missing sisters. Perhaps that someone is you. When KIRBY LARSON was researching Hattie Big Sky, she came across a 1920s photo of a Montana farm girl in overalls standing next to an exquisite Japanese doll. Kirby wondered what was the story behind their meeting? She did some research to satisfy her curiosity, but it would be several years before she could turn her full attention to the Friendship Dolls' story. Now here it is for readers everywhere.